Welcome to Indian Thematic Society, India's only Society which publishing a regular philatelic magazine on topical collection. For a stamp collector to contact you easily and subsequently do exchange with you, it is of utmost necessity to enter all the details of yourself in your profile here. If you are not intended to update your real photo - then add any stamp of your choice in place of your photo. We would therefore like to request you to update your profile in Indian Thematic Society, at the earliest to enable others to know more about you and your activities, but not later than a week. This is your last chance to update your profile, otherwise due to some technical problems; we will force to delete you from our membership list here. As we are having about 500 members who once wished to join us but not updated their profile so far, resulted not listed yet, within members displayed in list of members. Thanking you with kind regards. 89. Anguilla – 1978 – SG 320/23 – 25th Anniversary of the Coronation of HMQ Elizabeth II – Complete set of four in pairs – Rs.120. 92. Bermuda – 1978 – SG 384/86 – 25th Anniversary of the Coronation of HMQ Elizabeth II – Rs.60. 115. Norfolk Islands – 1978 – SG 207/08 – 25th Anniversary of the Coronation of HMQ Elizabeth II – Rs.50. 118. Seychelles – 1978 – SG 428/31 – 25th Anniversary of the Coronation of HMQ Elizabeth II – Rs.60. 124. St. Lucia – 1978 – SG 438/41 – 25th Anniversary of the Coronation of HMQ Elizabeth II – Rs.60. 125. St. Vincent – 1978 – SG 556/59 – 25th Anniversary of the Coronation of HMQ Elizabeth II – Rs.50. 126. 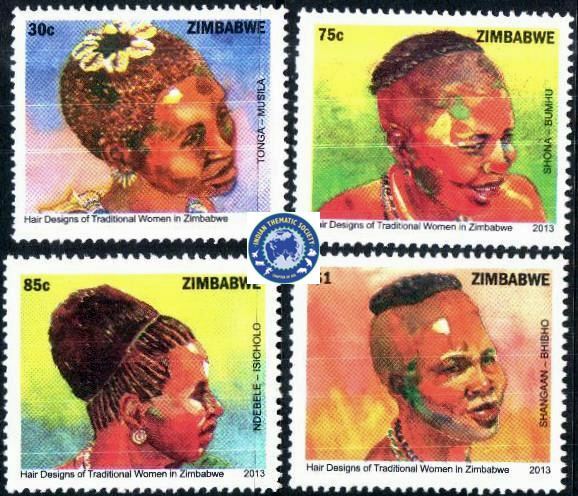 St. Vincent of Grenadines – 1978 – SG 130/33 – 25th Anniversary of the Coronation of HMQ Elizabeth II – Four complete sheet-lets of 10 stamps and 2 labels – Rs.450. 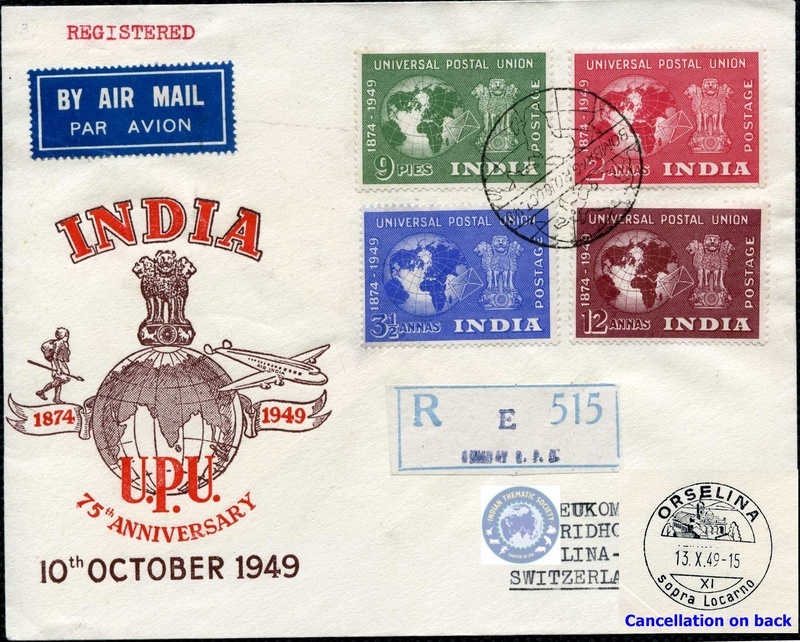 India – 1949 – SG 325/8 – 75th Anniversary of U.P.U. – Complete set on privately printed F.D.C., Registered to Switzerland with pictorial Swiss stamp of receipt “Oreselina / 13.X.49 Sopra Locarno” on reverse, very fine & rare - Rs.1000. - Interested? THANKS to all bidders for recently closed “ITS Postal Auction No.66”. Congratulations to all successful bidders and wish all the best to others for future ITS Postal Auctions. If you wish to sell any of your duplicate items just send the same to us stating complete descriptions and prices for inclusion in next Auctions. Big thanks for your all support. THANKS to all bidders for recently closed “ITS Postal Auction No.64”. Congratulations to all successful bidders and wish all the best to others for future ITS Postal Auctions. In the meantime you are requested to let us know which type of material you wish to see in these Auctions, as we have are in receipt of so many thematic lots from overseas countries and select next auction accordingly. If you wish to sell any of your duplicate items just send the same to us stating complete descriptions and prices for inclusion in next Auctions. A big thanks for your all support. 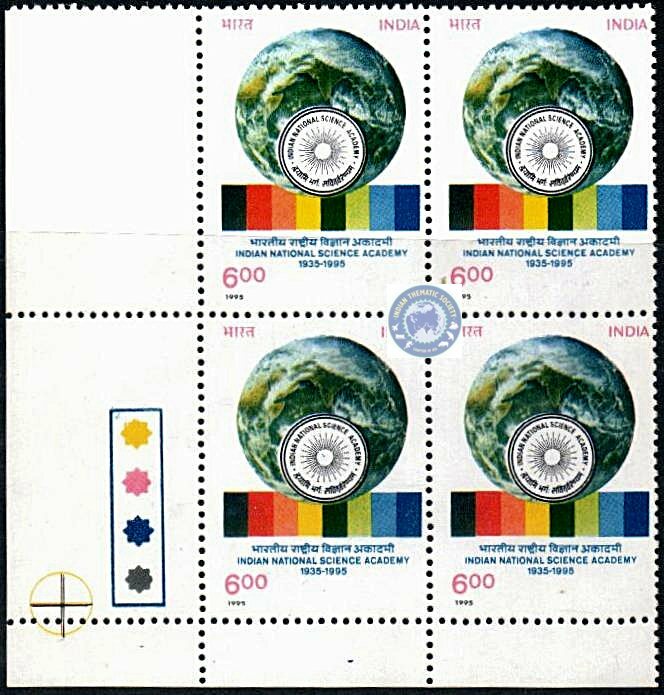 Lot No.84 of current ITS Postal Auction - India – 1995 – SG 1617 – 60th Anniversary of National Science Academy; Globe & Emblem – Block of 4 with T/L – Rs.120.